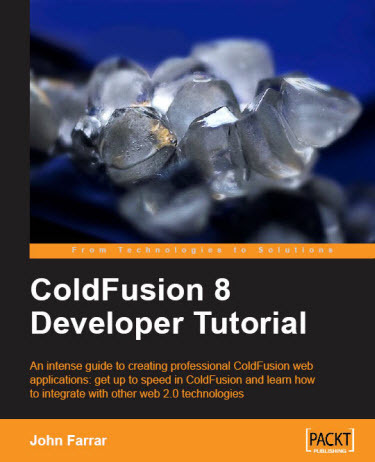 ColdFusion 8 Developer Tutorial is written by John Farrar and published by PACKT Publishing. This book is for beginners to learn ColdFusion 8 and its new features in fast track manner without prior ColdFusion knowledge. It also covers the new features of ColdFusion 8 Update 1 release. This book will give you heads-up on not only in ColdFusion but also in the existing web 2.0 technologies and how to integrate them with ColdFusion. Web pages – Static to Dynamic chapter covers on the basic introduction about static and dynamic web pages and brief intro on using arrays, lists, Structure, variable definitions, Looping and condition processing in ColdFusion. Application, Session, Request Scopes: This chapter covers on the life span of scopes and talks extremely on Application.cfc file methods, variables and their specific usage and also shows you to how to set up mappings and Custom tag paths per Application basis. CFCs Database and Web Forms are covered in two chapters and is all about using CFC in an efficient way and talks about the different scopes of variable in CFC, object method access control and using getters and setters for protecting inner characteristics of objects with code examples. Chapter also covers on with 'real world' example on web forms and how to manage database operations on it using CFC. Custom Tags chapter talks about the different forms of code Reusability with ColdFusion and about the custom tag specific thistag scope and using nested custom tags. It also talks on managing and how to call custom tags in different ways. 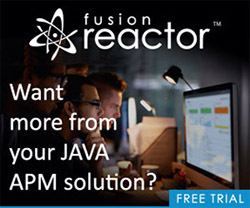 Authentication and Permissions chapter covers on about how to recognize users with built-in ColdFusion functions and how efficient we can utilize them in our code. The cool part of this chapter is how to build our sample site administration functionality by defining the authentication data model and setting up custom and advance authentication functionality. Building Search Abilities chapter covers on using CF variety search Solution for creating Search functionality. Also covers on integrating third-party searching functionality to sites using Google Site Search and Google Custom Search Engine using CF Custom tags. Working with PDF, File, Email, Images: These topics are covered on two chapters a chapter dedicated on PDF generation shows up the functionalities of creating header, footer, bookmark and printing PDF documents from server. Also covers on how to merge, Delete, Encrypt PDF document using CFPDF tag. The other chapter gives you basic intro on using CFFile, CFMail, CFImage tags and functionalities and it also includes the notes on what are the new features are added with CFMail and CFImage in ColdFusion 8 Update 1 release. Feeds, REST Services, WEB Services chapter is all about using CFFeed with 'real world' examples on reading different feed formats like RSS, CDF, JSON, SQL. Also covers on XML handling and using REST and SOAP web services in detail. Building Dynamic Reports chapter covers on creating simple reports and how to generate reports outputs as PDF, Excel, CSV, XML, JSON formats with code samples. Also covers on about creating reports using CFReport with Report Builder. Dynamically Generated Web Presentation is about generating web presentation using CFPresentation tag and how to cache the contents and talks about the dynamic benefits of using CFPresentation. Appendix A covers on how set up the local development environment with different tools and engines available in the web. Appendix B covers on resources to build your skill which includes list of top blogs, Frameworks, CF Sites, and Libraries for integrating with CF, API, Testing and Debugging tools for ColdFusion. Topics in this book are covered in a reader friendly manner from basic to Advance levels in ColdFusion. Most of the sample codes in this book are written using CFC and cfscript tag this will make a reader more familiar with CF Components. The only concern of mine is the Code samples are not highlighted which makes a bit normal but it's not a problem. Thanks John for this great book for ColdFusion Community. Packt publishing is having both the PDF and Printed version of the book. I would like to have code samples in different color or highlighted with different borders which make code samples more readable. This is really a good book for get start with CF 8 features.